ENGLEWOOD, Colo. - April 26, 2018 - PRLog -- HomeAid Colorado and Emergency Family Assistance Association (EFAA) dedicated the 16th Street Transitional Housing space on April 25, which adds five new affordable housing units in the City of Boulder. These units, built by William Lyon Homes, are slated specifically for families with children who are experiencing the trauma of homelessness. The ability to have a stable home for up to two years gives families a chance to get back on their feet and work toward a brighter future for their children. HomeAid Colorado is a nonprofit organization that works to build housing for homeless families led by a builder captain who facilitates in-kind donations from subcontractors and vendors. Led by William Lyon Homes, these relationships culminated in more than $400,000 of in-kind donations from subcontractors and suppliers. A leader in the home-building industry, they also donated 100% of their cost to the project and helped secure in-kind donations from the building trades and industry partners. "We have so appreciated everyone's generosity, flexibility and determination," said Laura Brayman McKenna, Executive Director of HomeAid Colorado. "On this project in particular, there has been such a sense that we are all in this together and we all take pride in the fact that, in the end, families will have a place to call home and EFAA can use their hard earned dollars for other important programming. When we pull together, we know we can make a difference in people's lives." Since 1918, EFAA has been providing struggling families in with the resources they need to thrive. Starting in the late 1970s, EFAA began providing temporary housing to families in need and has continued to increase its housing stock as the need for affordable housing has risen. The 16th Street opening coincides with EFAA's 100th anniversary serving Boulder County. 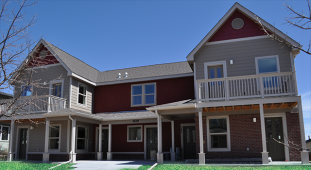 16th Street includes 2 three-bedroom units and 3 two-bedroom units and brings the number of housing units EFAA owns or manages in Boulder County to 57. "Stable housing is foundational to the long-term success of a family building back up after a crisis," says Julie Van Domelen, EFAA's Executive Director. "In an area that is quickly losing affordable housing options, these five homes will make a significant impact for generations to come." The debt-free project was made possible by donations from individuals, grant money from the City of Boulder, Boulder County Worthy Cause Fund, and the State of Colorado Department of Local Affairs, and in-kind donations from HomeAid Colorado and William Lyon Homes. HomeAid Colorado is a nonprofit provider of housing and resources for homeless families and individuals. HomeAid connects home builders with respected nonprofits like EFAA to help make sure every Coloradan has access to quality housing and living essentials. Since 2001, HomeAid Colorado has garnered more than $5 million in in-kind donations, adding more than 374 beds for the homeless. HomeAid has created assets for local nonprofits totaling more than $14 million with more than $6 million worth of projects in development, forecasted to add or preserve 99 beds. For more information, visit homeaidcolorado.org. http://www.homeaidcolorado.org. For 100 years EFAA has been dedicated to empowering families to thrive. Since 1918, EFAA has been Boulder County's community safety net for families, seniors and people with disabilities to meet their basic needs. As Boulder's official Family Resource Center, EFAA operates 57 emergency and transitional shelter units, provides food, rent assistance, utilities assistance, and supports clients' efforts toward financial stability and self-sufficiency through long-term and short-term casework, education and advocacy. For more information please visit www.efaa.org. William Lyon Homes is one of the largest Western U.S. regional homebuilders. Headquartered in Newport Beach, California, the Company is primarily engaged in the design, construction, marketing and sale of single-family detached and attached homes in California, Arizona, Nevada, Colorado, Washington, Oregon, and Texas. The Company has a distinguished legacy of more than 60 years of homebuilding operations. In Colorado, William Lyon Homes builds in the communities of Avion (Denver), Candelas (Arvada), Flatiron Meadows (Erie), Southshore (Aurora), The Lakes at Centerra (Loveland), and West Village (Timnath). For more information please visit www.lyonhomes.com.